Hutt Valley District Health Board (DHB) is using robots to process the 24,000 e-referrals it receives every year. Hutt Valley DHB is based in Lower Hutt, and covers an area including Upper Hutt, Wainuiomata and Eastbourne, located in the Wellington region of New Zealand. 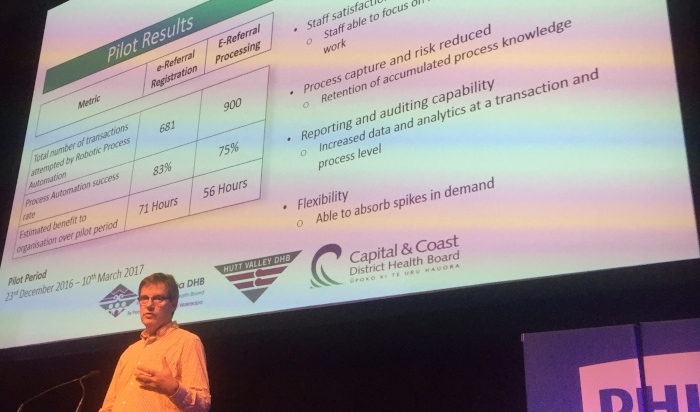 The DHB, along with Wairarapa and Capital and Coast DHBs, has recently embarked on a project to automate the Mental Health Intake Assessment process. Former chief information officer at Hutt Valley Shayne Hunter spoke at the HiNZ 2018 conference in Wellington last November about the e-referrals automation project. He said this was previously an end to end process of manually registering and processing all e-referrals, estimated to require more than 4600 hours annually or the equivalent of 2-2.5 full time clinical administrators. “We embarked on a project to try and make that robotic,” he explained. During a 3-month pilot period, the robotic process automation attempted 681 e-referral registrations had an 83 percent success rate, saving an estimated 71 hours in staff time. For e-referral processing there were 900 attempts and a 75 percent success rate, saving 56 hours. He said there were problems with the data coming in, such as missing data, which means human interpretation is still sometimes needed. “It doesn’t have to be start to finish robotically, it can co-exist with humans in the process,” said Hunter. A plan to use robots to speed up basic clinical coding, so coders can spend more time on difficult coding scenarios, has been paused due to the high level of complexity. However, the Mental Health Intake Assessment project is moving ahead and the DHBs are hoping to be able to automate 100 percent of the process. Hunter added that the DHB is also looking at embedding AI to interpret the content where there is missing data.